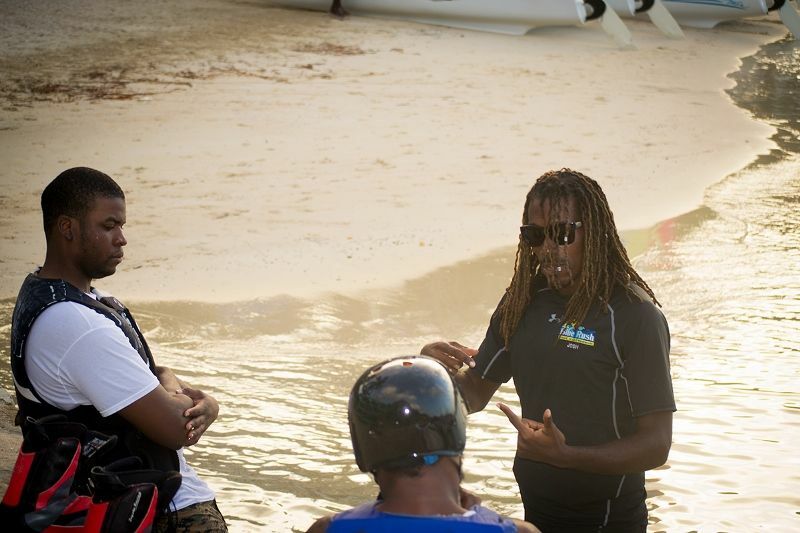 Wheatley, along with his cousin and business partner Trevor L. Walters, started out wanting to meet the demand for water sports in the Virgin Islands but their aim now is about having the most diverse water sports package available in the territory. A Virgin Gordian, Wheatley attended the Bregado Flax Educational Centre but after fourth form he left for the United States of America and finished his high schooling at the Boys and Girls High School in Brooklyn, New York. Wheatley said he then returned to the Virgin Islands and enrolled at H. Lavity Stoutt Community College but after about a year or so opportunity knocked. “It is not that I didn’t value education; it was just that we saw the opportunity and felt that we could implement it right away,” Wheatley said, adding that he has intentions of studying again at some point. He made it clear, however, that he has not one day regretted making the decision to go in to business at the time that he did. 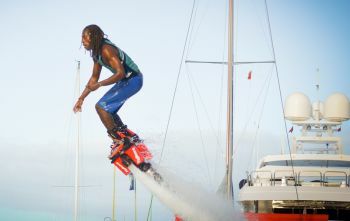 One of the recent major additions to Blue Rush Water Sports is flyboarding, which was introduced early last year. Since then the business has literally taken off, with many residents and tourists alike finding flyboarding quite a thrilling and unforgettable experience. Wheatley said he is proud to be making a contribution to tourism and recreation in the Virgin Islands and wants to see the business grow from strength to strength. He said the business has been building a lot of partnerships and as people get to know about it there have been lots of referrals. Pursuing a dream is not always smooth sailing as there always seem to be obstacles to take persons off course. For Wheatley and his business partner, they had their fair share of challenges, including banks rejecting their proposals to borrow money to start the business. "We worked several jobs and got some assistance from friends and family." 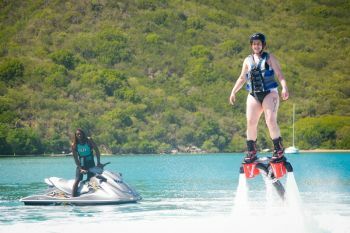 From that experience, Wheatley said it is the hope that Government would continue to do all they can to assist locals who want to become entrepreneurs. 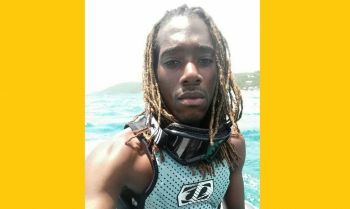 Wheatley’s support team includes the business community of Virgin Gorda and family members, including one of his uncles, who he said he actually worked for and learned a lot from that job experience. Joshua N. Wheatley advises youth to be purposeful, motivated and persistent. “Come up with a plan, which is most important. Be driven, be motivated and never take no for an answer. We definitely had a lot of obstacles when we started and we still have but if the door closes find another door, if the other door closes then look for a window, and if you can’t find a window, make an opening somewhere. “Just never give up. I believe in the power of the tongue and speaking things into being,” Wheatley shared. 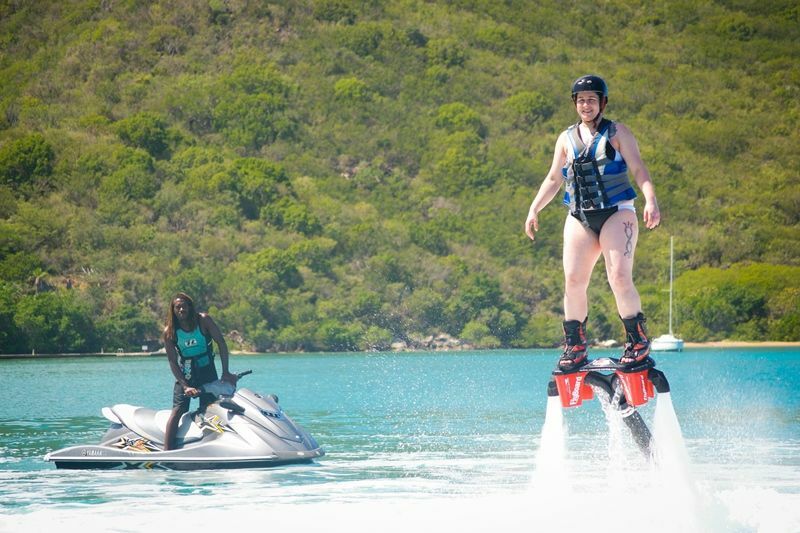 Persons wishing to experience the services of Blue Rush Water Sports can call: 1-284-544-7515 or 1-284-547-0583, or Email: mail@bluerushwatersports.com. The company’s website is bluerushwatersports.com. I am happy to see this. Our young people doing great things. Keep up the good work guys. Always continue to do your best son. Be safe. Amazing dude amazing company amazing entrepreneur a truly amazing choice VINO. I truly wish Josh and Blue Rush all the best 2016 and beyond. From one entrepreneur to the next the sky ain't the limit, you are. Be amazing and have fun.